Update! Contest: Poetry of Armillo! We are no strangers to contests as we have held many of them in the past, but this week we've decided to do our most unique contest yet! 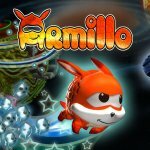 Today July 13th until Monday July 21st is the deadline for this contest and the rules are simple, just post a peom about the character Armillo from Fuzzy Wuzzy Games' latest title Armillo in our comments! At the end of the contest Fuzzy Wuzzy Games will decide which poem is the best and the author of that poem will be named the winner of the contest and will receive a download code for the Wii U eshop title Armillo! We look forward to your responses in our comments and hope that you have fun! Update: The contest is now over! FuzzyWuzzyGames will decide who the winner is and we'll be sure to send that lucky person a download code for Arimllo! Good luck to our contestants! Re: Update! Contest: Poetry of Armillo! I doubt that I stand a chance in a contest such as this one, but I'll give it my best shot. Armillo is the hero of his people while his brother is oh so cool. The hero dreams of everlasting peace and will always fight for justice so evildoers look out! He will always help those who need it because that's who he is. Armillo is the true form of love and justice and he will always will fight for what he believes in. He is the Galaxy's one true hero! In a parallel universe, and the darkbots he fought. Many levels and worlds, all for Armillo to unwrap. Travel to the Critter Corner, it's like going to a mall. He'll keep fighting until all the darkbots are gone. He may be Armillo's worst pet peeve. Puzzles and Items are all around. This is only a quarter of what this game is about. This game is perfect, it'll never get bland. You can also play as his brother too. He'll send him crashing to to the ground. So go pick up a copy of his game today. Defeating an evil army of creation. I may be small but I dream big too. To muscle through any obstacle no matter the length. Another superb poem! Nice work. Our contest is over so no new applicants are allowed. Good luck to our contestants who have entered the contest! We should know who the winner is soon!